The Iowa 4-H program, in partnership with Iowa 4-H Foundation, has launched a new blog detailing the history of ISU Extension 4-H Youth Development. Included is Iowa 4-H history by county. 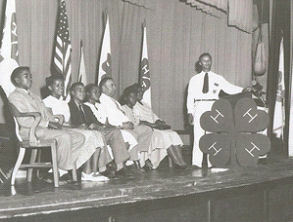 The Iowa 4-H program, in partnership with the Iowa 4-H Foundation, celebrated National 4-H Week, Oct. 2 to 8, 2011 with the launch of Iowa 4-H History by County, a new blog detailing the history of Iowa State University Extension 4-H Youth Development. Clay, Keokuk and Page counties are the first to have the history of their 4-H programs published on the blog, at www.iowa4hfoundation.org/. Over the next two years, 4-H staff and volunteers will review additional county 4-H histories, with two to four being published on the blog each month, says Shelly Greving, marketing director for the Iowa 4-H Foundation. The online history notes that Keokuk and Page counties were among the first sites in the nation to have hands-on, after-school learning programs for young people, under the leadership of Jessie Field Shambaugh and "Cap" Miller. Clay County is the site of the largest county fair in Iowa, and the fair's history is intertwined with the county 4-H program. "The efforts that led to today's Iowa 4-H program began 110 years ago, when local educators, volunteers and Iowa State began teaching children how to select the best seed, raise the best crop and bake the best bread. Today's 4-H youth develop citizenship, communication and leadership skills; and learn about everything from aerospace to zoology," says Chuck Morris, director of ISU Extension 4-H Youth Development. The idea that led to the blog took root 10 years ago during Iowa 4-H's centennial year, when several 4-H volunteers and ISU Extension staff members started talking about writing an illustrated history of 4-H in Iowa, Greving explains. Those early discussions resulted in "A 4-H Story: Helping Hands, Caring Hearts" (4H 4805), an illustrated 4-H ABC book for children. The book is available from the ISU Extension Online Store, store.extension.iastate.edu/. County celebrations during the 4-H centennial, as well as ISU Extension's centennial in 2003, resulted in the gathering of numerous pictures, record books and memorabilia. Florine Swanson, retired Iowa 4-H Foundation executive director, led the online history project as counties compiled their history and submitted it to the review committee to be published on the site, Greving says. "All these efforts have resulted in what now will be a living history of 4-H. We hope 4-H members, alumni, volunteers, leaders and staff will add their comments and continue the history of 4-H, sharing the many facets of each county's 4-H program," Greving says. "Individuals may choose to continue the legacy of 4-H by making a donation to directly impact Iowa 4-H or their county 4-H program." Those who wish to support 4-H in their county may make a donation to their county 4-H endowment through the Iowa 4-H Foundation at www.iowa4hfoundation.org/.